After defining the right key question, evaluating the performance gap and the sense of urgency we asses our clients’ business by mining big data as well as emotions. 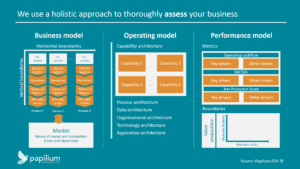 We use a hollistic approach that consists of evaluating their business model, capability model and performance model. During the business model assessment, we examine the boundaries of our clients’ company. The horizontal boundaries are a result of the variety and scope of product and services offered. A beverage company currently sells beer and soda. What about expanding the horizontal boundaries and sell water as well? Or what about shrinking the horizontal boundaries and only sell soda? We also evaluate the vertical boundaries. The same beverage company outsources the production of their packaging material to a supplier. Does it make sense for the company to start producing their own packaging in-house? What’s the offering of other suppliers active in the market? Finally, we consider the market and competitive arena. What is the nature of the markets and the competitive interactions between firms in those markets? Who are the direct as well as latent rivals? In parallel, we conduct an assessment of our clients’ operating model. We look at their distinct market approach, resources and capability architecture, identifying distinctive capabilities and their dynamic nature. Based on the upcoming challenges, which resources should the company create or acquire? Which capabilities should the company build, and which will become redundant in the future? How should the underlying process, data, organisational, technology and application architecture adapt? Investigating our clients’ performance model is the third element of our assessment. We mainly look at operating cash-flow, EBITDA and Net Promotor Score to understand the key drivers of a company’s value proposition and how these are spread out accross different business units and revenue streams. Which activity is generating how much costs and revenues? Where could we possibly achieve efficiency gains and revenue increases? What’s the client perception and how is it evolving? Applying this hollistic approach is a solid challenge. But we’re convinced it’s the best way towards a true business transformation that substantially grows value, fact based.